The Sinn Fein President Gerry Adams has branded as “totally and absolutely unacceptable” attempts by the DUP to attach the parades issue as a new condition to an agreed deal on policing. The chief MI5 witness in a ‘Real IRA’ arms trial refused to give evidence unless he was given 650,000 pounds sterling ($1.1m) and a medal from the Queen. The family of a Derry teenager shot dead by British soldiers in July 1972 have urged the British Ministry of Defence (MoD) to co-operate fully with a new inquest into the killing. A journalist faces a twenty-five thousand pound legal bill despite her successful legal challenge to a Crown force demand that she hand over information pertaining to the ‘Real IRA’. An infamous loyalist killer is back behind bars after attacking two sisters in a pub in Coleraine, County Derry. Relatives for Justice has campaigned on behalf of the Hegarty family in connection with the killing of their son, Daniel. The following is their profile on the case. The controversy over the 1981 hunger strike has continued with conflicting messages from the current and former Sinn Fein leaders, and from former prisoners who were inside Long Kesh prison at the time. An extraordinary thirty-five MI5 agents are to be called to court to give evidence evidence behind screens against three men accused of dissident republican activity. The Ulster Unionists’ sole member of the Westminster parliament failed to turn up to her party’s conference at the weekend. 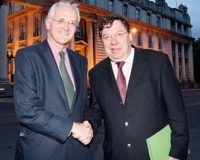 Sinn Fein assembly member Francie Brolly could be replaced next month by a former member of the British Crown forces. Raymond McCord has said he could not have hoped for anything better from the Congressional hearing in the United States into his son’s killing. Filming for a new movie about the Easter Rising will finally get under way in Ireland in April 2010. The Irish are alive and well in Jamaica, writes Rob Mullally. The third and final part of a three-part series. The hunger strikers were never dupes but could only make decisions on the basis of the information they had. The 26-County state appears to be heading for strikes and industrial unrest on a scale not seen for many years after Ireland’s major trade unions announced protest actions ahead of the December budget. 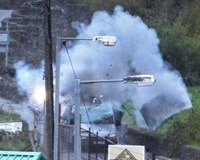 A bomb exploded at a British army base in north Belfast earlier today. Talks over the devolution of policing and justice powers from London to Belfast have concluded with the DUP still stalling despite a pledge of significant British government funding for the move. A local resident last week blocked the entrance gate to a Shell Inc. construction site for which there is no planning permission, refusing to move until proof was provided that Shell’s works on the site are legal. Sinn Fein President Gerry Adams has said sectarian parades by the Orange Order “will have their place in a new Ireland” but they should be held “on the basis of respect and cooperation”. After being closed to the public for more than a decade, Daniel O’Connell’s crypt below the landmark round tower in Dublin’s Glasnevin cemetery is open for visits, more than 160 years after his death. The testimony of Raymond McCord Sr. before the US Congressional Committee on Foreign Affairs’ Subcommittee on International Organizations, Human Rights and Oversight, on the subject of collusion. The revised programme for government in the Twenty-Six Counties offers nothing to the thousands who have lost their jobs over the last 12 months and face losing their homes. The people of the 26 Counties are being prepared for an unprecedented series of wage cuts and devastating cutbacks by the corrupt coalition government in Dublin. Plans by the New York stock exchange to set up a software facility in Belfast have been held up as a demonstration that the north of Ireland is a normal place for business investment. 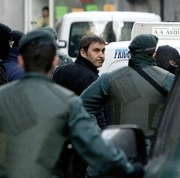 The Spanish government has ended a new political initiative in the Basque country with the arrest of ten prominent pro-independence left activists. The President of Republican Sinn Fein, who recently announced he is stepping down from the position, is interviewed. Prisoners associated with the INLA (Irish National Liberation Army) currently being held at Portlaoise jail in the Irish midlands have endorsed a statement on Sunday in which the INLA’s armed struggle was declared to be at an end. There have been further claims of progress by Sinn Fein in its talks with British prime minister Gordon Brown over the policing and justice powers. However, the DUP has said there remain matters which require resolution. John O’Donoghue formally resigned as Ceann Comhairle [speaker] of the Dublin parliament yesterday, defiantly blaming others for the scandal over his expense claims. Sinn Fein President Gerry Adams has accused the Green Party of having “signed up for savage cuts in public spending, NAMA and more attacks on working people and disadvantaged citizens” after it agreed a new programme for government with Fianna Fail. The International Fund for Ireland (IFI) has been accused of paying a six-figure to a group linked to loyalist paramilitaries, no questions asked. When an Irish republican dies in British police custody it is certain to give rise to an atmosphere of suspicion and recrimination. 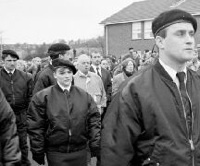 A decision by the Irish National Liberation Army (INLA) to formally draw its armed campaign to a close has been welcomed by the political parties in the North but has caused considerable surprise to its own supporters. 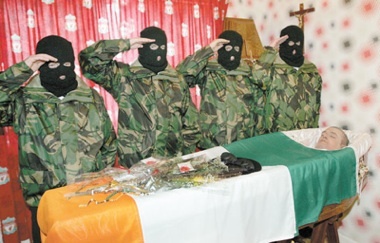 Unionists have condemned the republican funeral for Volunteer John Brady as “obscene”. The organisation once known as the ‘Official IRA’ has begun decommissioning talks with the IICD arms body, it has been claimed. 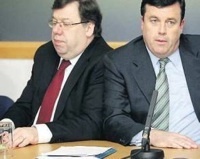 Green Party members have set the scene for massive political upheaval in the 26 Counties this winter afer they voted to stay in government and support a programme of unprecedented budget cutbacks in tandem with the gigantic NAMA bailout for bank shareholders and developers. US Secretary of State Hillary Clinton has urged the North’s political leaders to “complete” the process of devolution during a one-day visit to Belfast on Monday. Republicans should cooperate with a commission to establish the truth about the conflict but only if it is independent and organised by an international body, Sinn Fein President Gerry Adams said this week. The final article by Sinn Fein President Gerry Adams for the Irish News on the recent controversy over the 1981 hunger strike. An announcement was made this afternoon that the INLA's armed struggle is over and that its future will be based around politics through exclusively peaceful means. The Green Party tonight voted to continue the Dublin coalition government with Fianna Fail and the highly controversial Nama plan to bail out Irish developers and their bankers. A volley of shots have been fired over the coffin of senior republican John Brady who died in “mysterious” circumstances while being questioned at a PSNI police station. 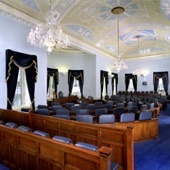 Following the ouster on Tuesday of the speaker of the Dail, an Ceann Comhairle John O’Donoghue, increasing turmoil has beset the political institutions in Dublin and threatens to overwhelm the coalition government. Talks between the first and deputy first ministers and British Prime Minister Gordon Brown on the devolution of policing powers have ended without agreement. 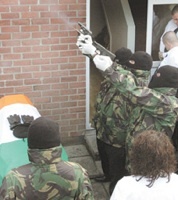 There has been a general increase in tension across the North following the arrival of the new PSNI chief, Matt Baggott. The North’s senior coroner is to stand aside from hearing an inquest into the killing of an IRA man shot dead by Crown forces 17 years ago. A young Fermanagh woman has spoken off her fear after being stopped and questioned by MI5 agents upon landing at a Spanish airport when she went on holiday earlier this month. One of the reasons for hostility to the Bloody Sunday Inquiry is to be found in a judgement delivered in the High Court in London last Friday in the case of Khunder al-Sweady. Peter Robinson is facing what every single leader of unionism has faced since at least the late 1960s. 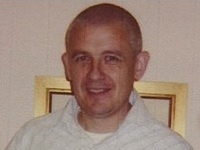 A well-known republican died in suspicious circumstances at a PSNI base in Derry on Saturday night. The Lisbon Treaty was backed on its second outing on Friday by 67 per cent of those who voted in the 26 County referendum. The positions of the northern parties on policing and justice hardened last night as it appeared the DUP will attempt to negotiate separately from Sinn Fein with the British government. Former IRA prisoner Gerry ‘Whitey’ Bradley has defended a book that lifts the lid on his life in the organisation, insisting he is “just telling my story”. The father of a Belfast man who was murdered by a unionist paramilitary group in 1997 has secured his plea to have a US congressional hearing into his son’s murder next month. International visitors arriving for bus tours of Belfast this week were shocked to see their drivers wearing bulletproof vests. A three part series on the history of the Irish settlers in Jamaica. 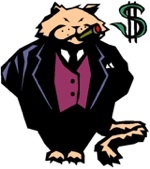 When the ruling class in the Twenty-Six Counties wants something bad enough it will do pretty much anything to get it. With results in from almost all of the constituencies, the Lisbon referendum has been passed in the 26 Counties by a margin of about two to one. Early tallies in the Lisbon referendum indicate that the Treaty is likely to be passed on the second attempt. Voters in the 26 Counties have the potential to draw a line in the sand tomorrow against a greedy European superstate in Brussels and the corrupt Fianna Fail government in Dublin. 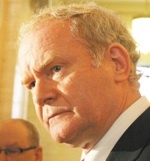 The North’s Deputy First Minister, Martin McGuinness admitted yesterday that power-sharing is facing a crisis. In a stinging rebuke to Peter Robinson, he said the First Minister “needs to get his act together”. The north’s sports minister has threatened to cut funds from Gaelic clubs or events named after “paramilitaries”. Children as young as three have been stopped and searched by the PSNI, it has been revealed. Sinn Fein Deputy First Minister Martin McGuinness addressed a fringe event at the British Labour Party Conference in Brighton on Tuesday morning. A loyalist faction has been blamed for leaving a device near Ballymoney in County Antrim. 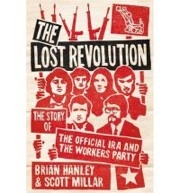 An interview with the authors of ‘The Lost Revolution’, Brian Hanley and Scott Millar. It also includes some analysis from the authors on key events covered in the book on the Official Republicans/The Workers’ Party. If you have a vote on Lisbon, use it to support democracy and freedom and VOTE NO.